NEW YORK--(BUSINESS WIRE)--Iceland Naturally, a marketing project promoting Iceland’s tourism, products and culture, today announced that visitors to Iceland from North America increased by 42.7 percent from January 2013 to January 2014. Visitors from Canada skyrocketed, up 152.5 percent, while U.S. visitors increased by a significant 34 percent. 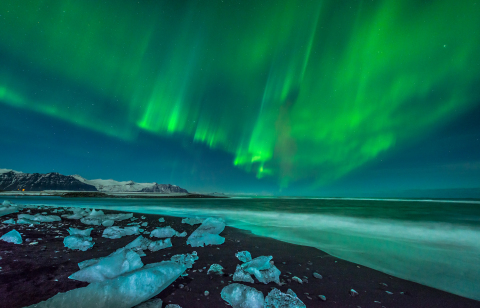 Known for its beautiful landscapes, vibrant culture and friendly natives, it is no wonder Iceland is increasingly becoming a popular vacation destination for many North Americans. The country offers spectacular views of the aurora borealis, which has been a huge draw since NASA announced that the northern lights are at their most intense in more than a decade. Icelandair now flies out of 12 major cities in North America and offers several unique and affordable travel packages. The new “Northern Lights and Glacier Hike” travel deal offers a northern lights hunt, glacier hike, Golden Circle tour, and natural steambaths visit for just $975! Click here to book your trip today and experience all that Iceland has to offer! Iceland Naturally is a cooperative marketing organization that promotes the tourism, services, products and culture of Iceland. It represents the true essence of Iceland; its creativity and spectacular natural wonders. The group is comprised of Icelandair, Icelandic Group, Islandsbanki, Reyka Vodka, City of Reykjavik, Icelandic Glacial Water, Blue Lagoon, Keflavik International Airport (KEF), Landsvirkjun, Promote Iceland and the Government of Iceland. For more information visit: www.icelandnaturally.com. Iceland sees impressive 42.7 percent increase in visitors from North America. Visitors from Canada skyrocketed, up 152.5 percent, while U.S. visitors increased by a significant 34 percent.